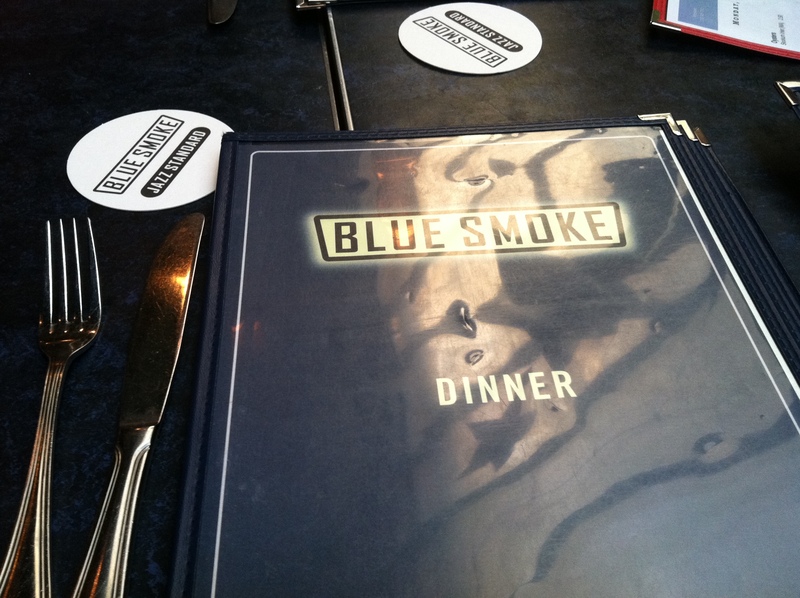 Mmmm Blue Smoke! I know you’re vegetarian/vegan so you’d prob skip over this one, but my favorite thing there is the bacon blue cheese dip. My work schedule is pretty fab here…I work 9:30 to 6, and my commute is only 15 minutes, so I can sleep until a decent hour and get my runs in. In New York, my schedule was 9-5 and my commute was sometimes 45 minutes in the mornings. I hated being up before the sun to run and was always tired! Hush puppies! You have to dip that fried bread in honey butter before you eat it!! So bad, yet soooooo good. Yes, we southerners like our fried stuff!!! ha! Is the fried bread like a hush puppy? My “job” as medical student was really busy as I was not only “working” or going to class, but also had to study a LOT. My “job” doing research is very chill, which is why I’m able to read blogs and comment on them at 9:45 am. ha! What’s a hush puppy? I’m moving to NC in 2 weeks so fill me in on this southern cuisine! And I know all about studying, just finished nursing school. Keep up the good work and I’m going to check out your blog now! 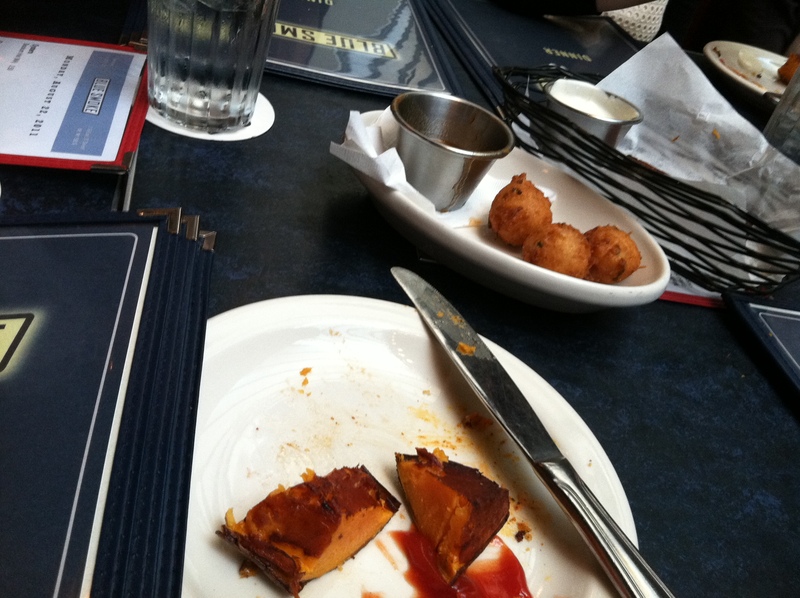 Basically fried cornbread-ish type of deal – its AMAZING. The weather was perfect for a run this morning, you can literally smell fall in the air here in Rhode Island! Sounds like you are going to own the NYC marathon, you are training so hard, I’m really impressed! My job is currently as a HR coordinator at a local movie theater and I really do a lot of blog reading and facebook “stalking” during my shifts. But it’s a lot of sitting so I try to get outside and walk whenever I can:) My boss is pretty chill. but soon I will be working as a nurse and on my feet for 12hr shifts! Gah! This weather is wonderful for running! It’s making me excited for Fall! Is that chocolate you have in your yogurt?? 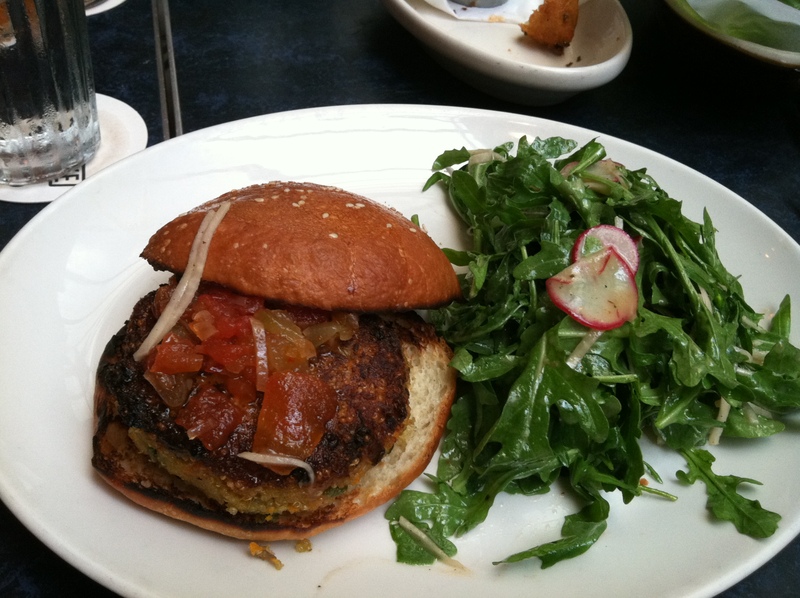 I’m not a big fan of BBQ, but the veggie burger actually looks good. 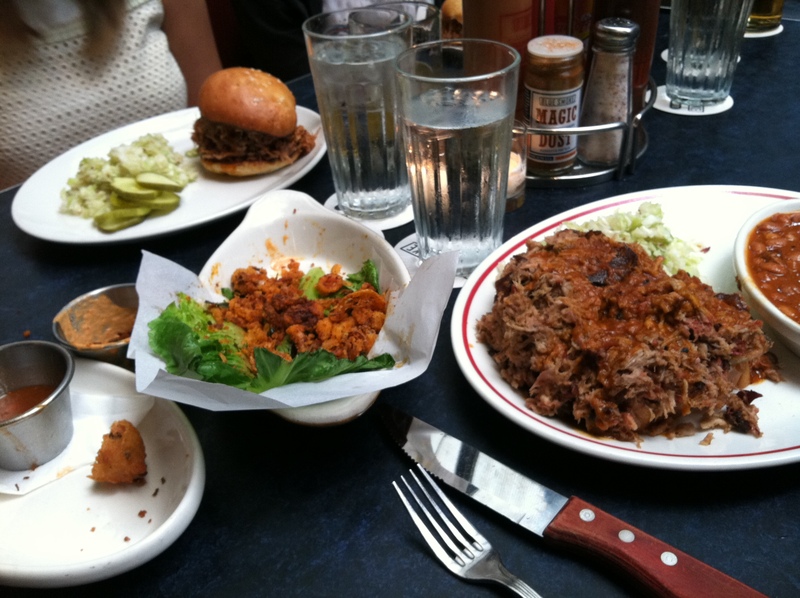 Good to know Blue Smoke has vegetarian options because my boyfriend keeps bugging me about wanting to go there. Luckily I don’t work long hours and it varies on weeks. I can only image how stressed you are with work/training AND School — you are super woman! I didn’t know you worked at an NYC PR Firm!!! Oh we have soo much in common 🙂 I feel you on nearly everything you mentioned in this post. I often question whether I’m cut out to make it here as well. But don’t forget to take a bit of time out to remind yourself of how good you are at life – because from what I can see, you’re handling it all very well! Glad you were able to get out for a break! 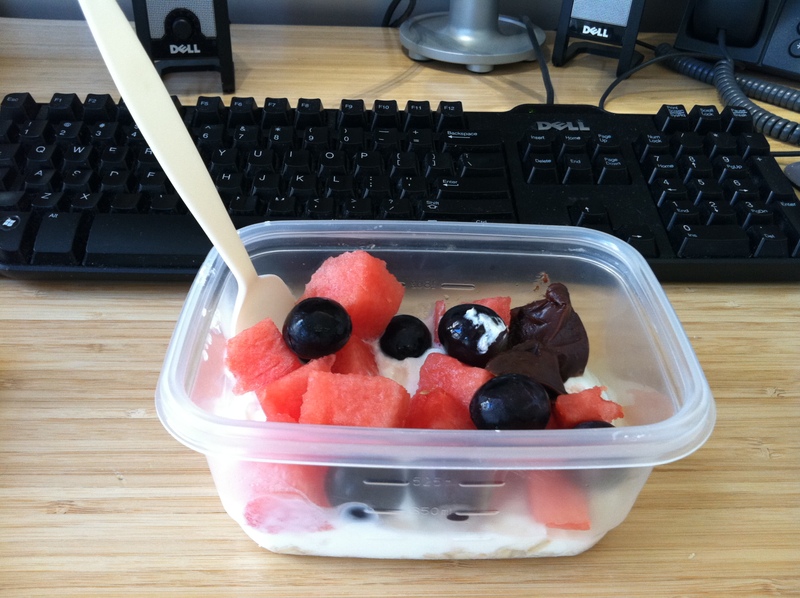 I work in a cubicle job – so plenty of meals are eaten in front of the computer as well. As a fellow PR gal in NYC, I feel you on the stress! Even during the times where I’m not working crazy hours, it’s a lot of ‘go-go-go’ jampacked into the day. Not much time to coast on by here (except my blog reading/commenting periods…hehe) I typically work 9-6:30/7 on average…some nights closer to 8:30/9. Lunch is always, always eaten at my desk. I’d escape for a bit but it’d just make for an even later night most times. I sit in an office most of the day for right now as a Nutrition Associate ( who would eat the fried bread !) …. 40 hours – it will speed up in October- April- I will be doing training and traveling out to all the counties. So right now I have normal hours at my ONE job BUT I accepted a part time job as an Adjunct Professor in Nutrition at the graduate school I graduated from. So… I have a 3 hr class once a week but I end up spending ~10 hours on the weekend preparing lectures, and 4 hours at night making the lecture and more time finding more information for the rest of the course. That makes 57 hour work weeks… then my “downtime” is training, running, blogging, kickball league, oh and I’m in a long distance relationship ( 500 mi ~ 8 hr drive one way). My hours are actually decent, we work a standard 37.5 hours a week (weird, but I can dig it). How about that earthquake, were you guys affected?? OMG! I just pulled up this window, thought I posted 12 hours ago!